Melissa Rubin, a recent recipient of the Pollock-Krasner Foundation and the New York Foundation for the Arts grants, and a former recipient of a JapanFulbright Fellowship, has received wide exposure in recent years for her striking, luminescent paintings. Her painting ‘Sinking’ was featured in April 2013’s ARTnews Magazine, and she was interviewed for CBS This Morning about her paintings in the New York City exhibition After Affects: An exhibition of Work by Artists Affected by Hurricane Sandy, at the Chashama Gallery. Her painting ‘Rolling In’ was featured on the cover and in a major article in the Spring 2014 issue of Encaustic Arts Magazine. The John Molloy Gallery in New York City will be exhibiting her solo exhibition 'Surfacing' in September 2014, and The Burgdorff Gallery of Southern Vermont College, Bennington, exhibited her solo exhibition ‘Still/Standing’ in the Spring of 2014. The Rockaway Artists Alliance, the Museum of the City of New York, and The Nave Gallery in Somerville, MA have recently featured her work in group exhibitions. Throughout her career Melissa has exhibited widely at many venues. Her art is in the permanent collection of the Encaustic Art Institute in New Mexico and many of her works are in private collections in the United States and Europe. 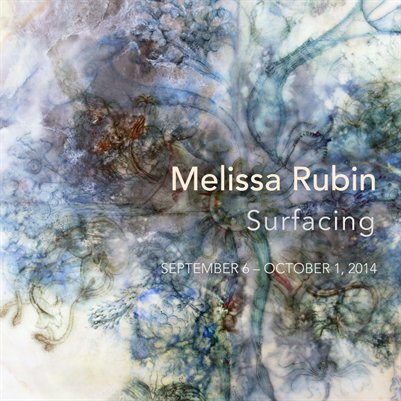 A full-color catalog of Melissa Rubin's New York exhibition "Surfacing" at the John Molloy Gallery. With an introduction by Ingrid Dinter.